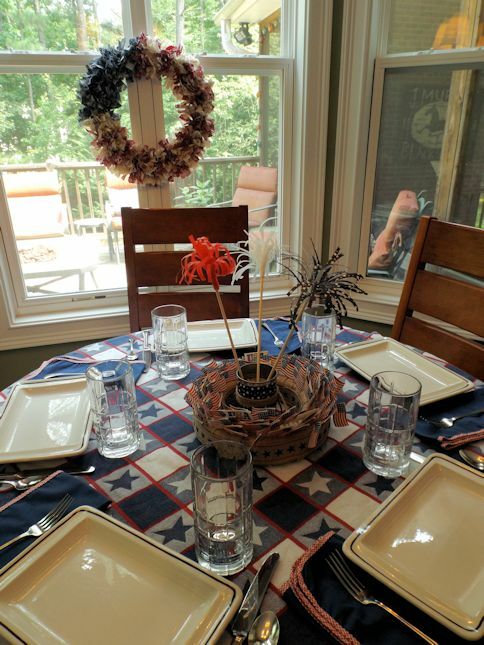 Recently, I had a wonderful time with friends and family getting ready for Fourth of July. 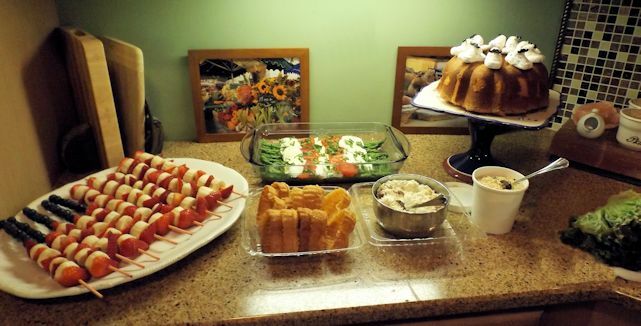 We gathered at my house and ate and crafted into the evening. I will give you a recap of the crafts and quickie how-to’s for each. 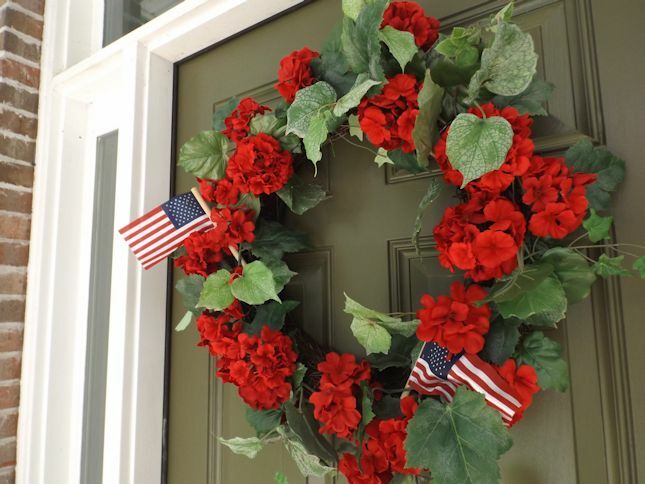 First, you see a photo of my front door with a wreath from Michael’s. Use those coupons ladies! 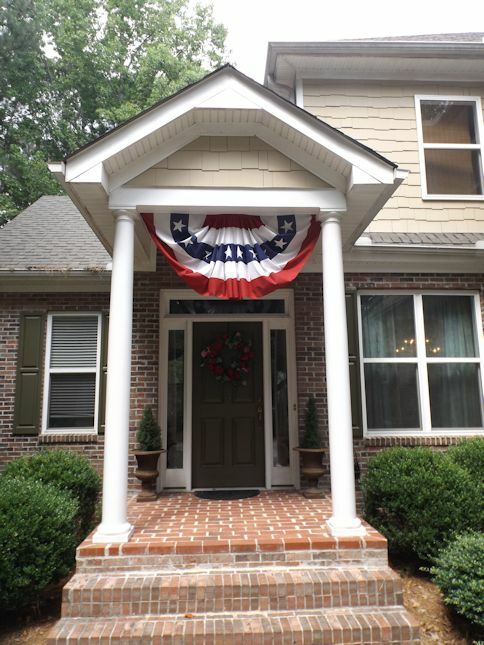 Next, is my front door with bunting from Ace Hardware. Is it just me or does their new jingle seem a little awkward…”Ace is the place with the helpful hardware folks.” I still sing the old one in my head whenever I hear the new one. Do you? Diane, Gina, and Terri joined me for food and crafts and an evening of creativity. 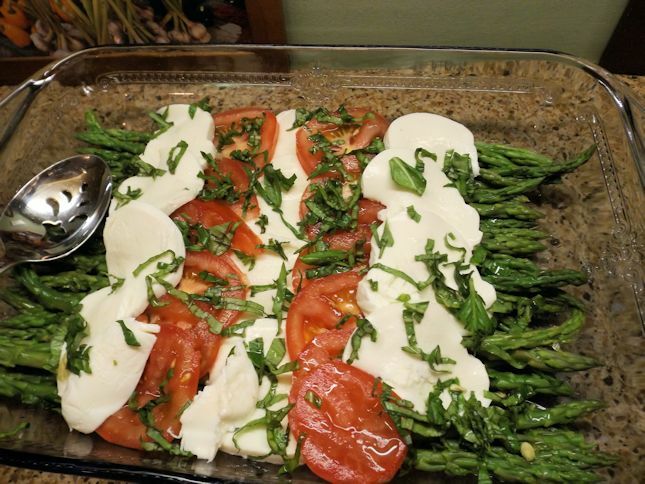 Dinner was chicken salad, shrimp salad, timbales from the Swan Coach House, asparagus salad made by Diane, and fruit skewers made by Terri. 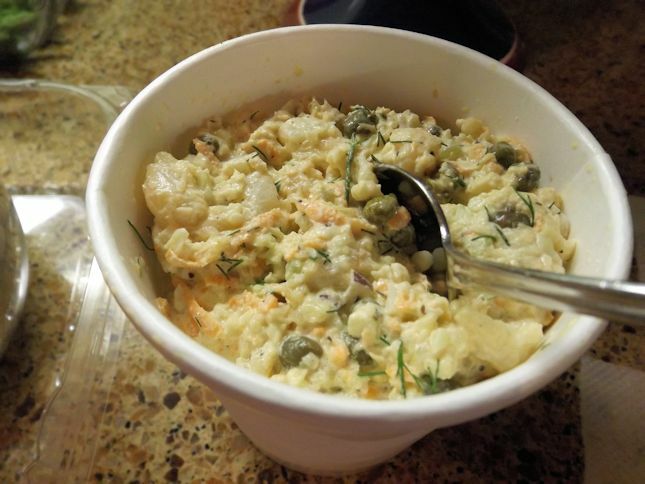 They were all delicious and if anyone wants recipes, I can provide them, but this post is super long as it is, so I will leave them out for now. 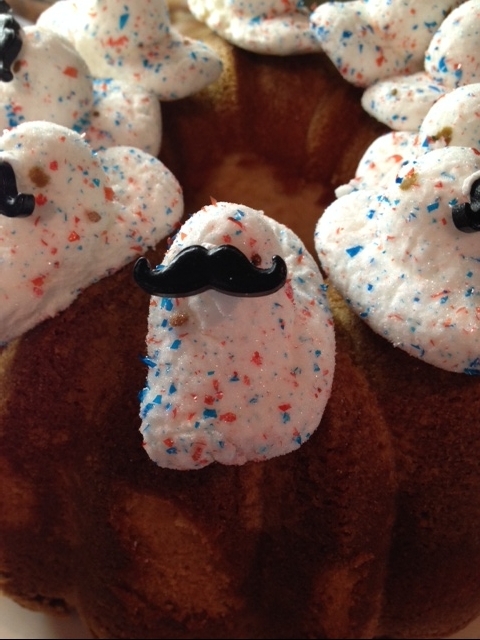 I also made a pound cake with mustachioed patriotic peeps. Still cracking up over those. Now, on to the crafts. We started with this oh so clever silverware holder from Diane. The basket came from the Dollar Store and the cans came from the pantry…lots o’ corn. First, you cover cans with Mod Podge and glue down the paper. Place another layer of Mod Podge on top of the paper. 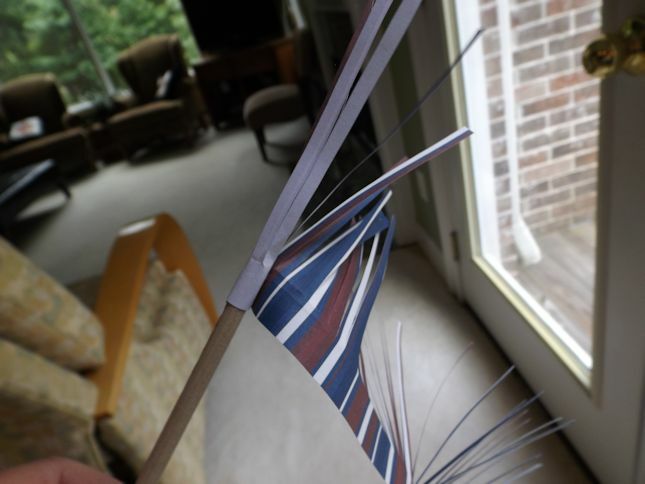 While the Mod Podge is still wet, tie jute around the top. Allow the end string to position under the string you are wrapping so both will tie at the bottom. The paper looks wrinkly here but it does dry flat. 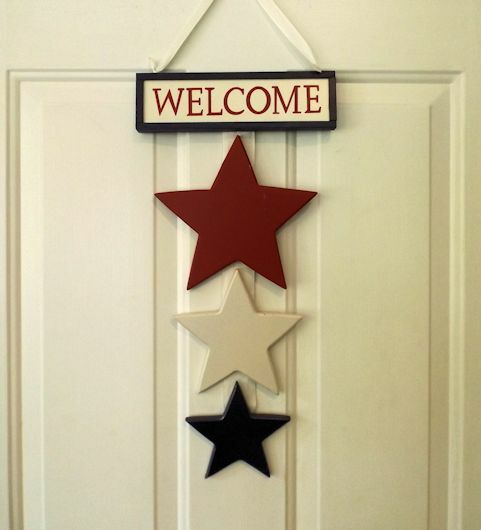 It was an easy project that had really cute results. 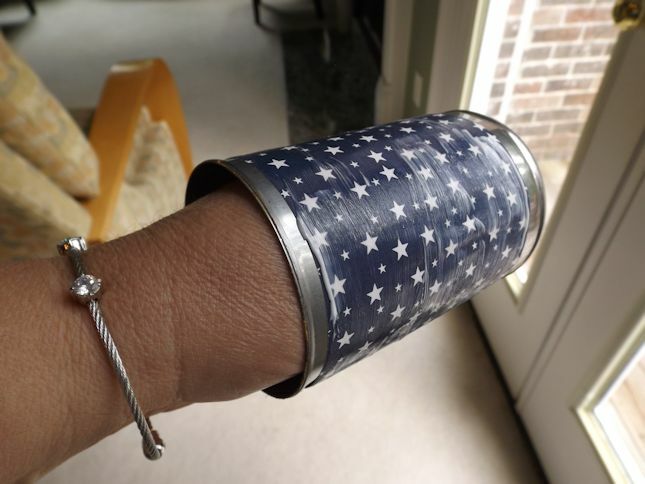 Be sure to only pick up one wet can at a time with your hands in the cans or you just might get stuck with double can-hands like the woven Chinese finger trap. Not that it happened to me or anything…. 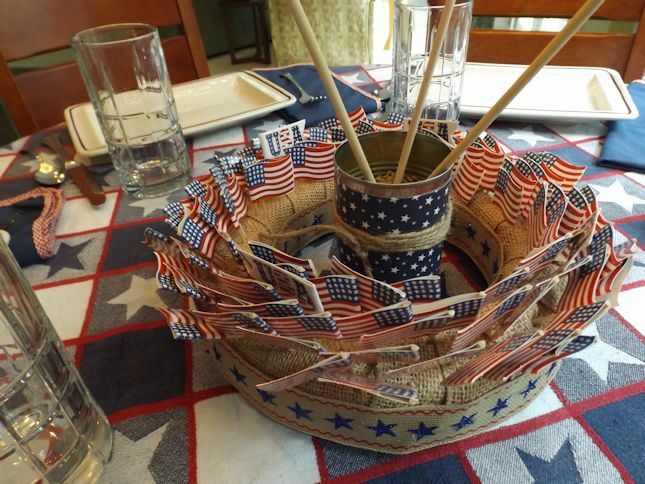 Last, hot glue ribbon or decorated burlap around the basket and you are done. 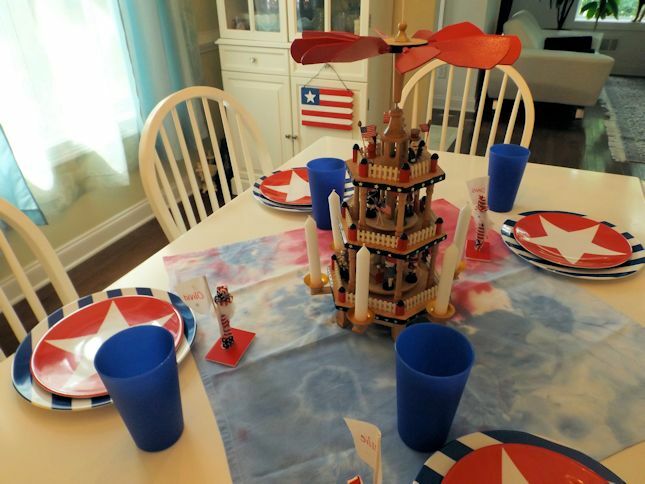 Next we made a craft that I loved but I somewhat disassembled it to use in different places in my house. 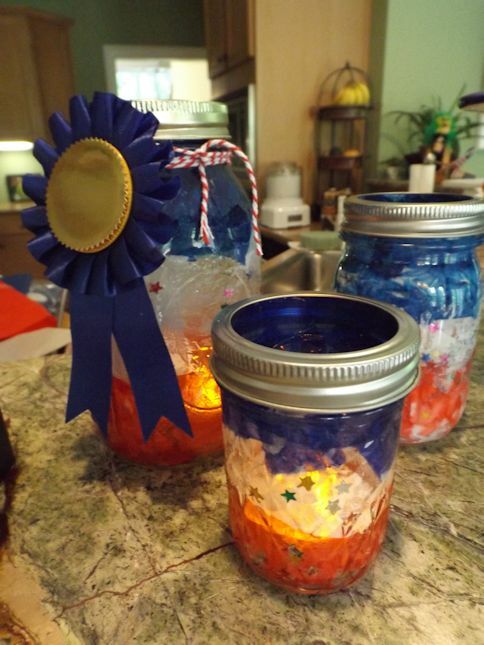 Diane led another craft to make paper fireworks in Mason jars full of white sand placed on top of a tie-dye table runner. I made all the parts but then as you will see I used each part in a different location in my house. 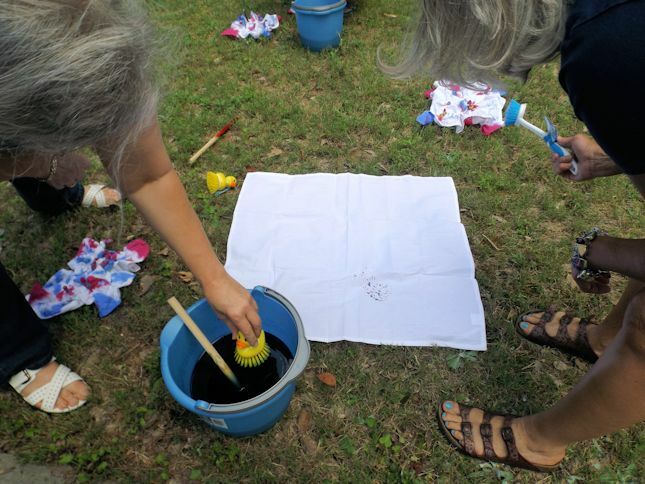 First, we did the tie-dye. I love, love, love to tie-dye. I adore all the splotches of color and I love how each piece is unique. This project was no exception. We used highly technical tools such as dollar store buckets and rubber duck pot scrubbers. Here is my tie-dye table runner on my dining room table. The whirligig came from Lillian Vernon Outlet many years ago in Virginia Beach. The plates and cups are from Target. I haven’t finished with silverware or napkins yet. I’ll show you the finished table on the Fourth. 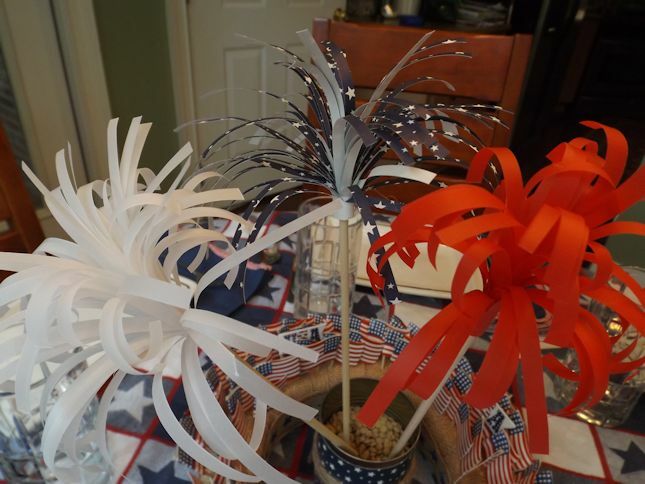 Then, the next part of the craft was to make paper fireworks. This was a simple craft with a great look. I could see using this idea for other holidays. It is fun and festive. 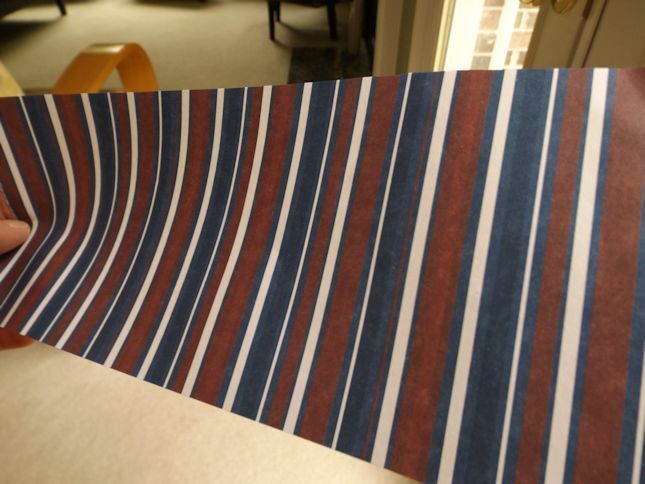 To make the paper fireworks, cut a 4-inch by 10-inch piece of paper. Fold it in half so it is now 4X5 inches. 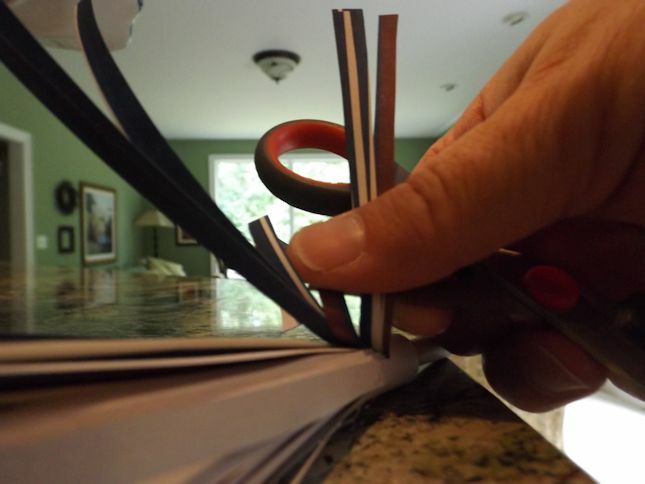 Fold over to the top as a guide for cutting While folded, cut into thin strips stopping at the top fold. 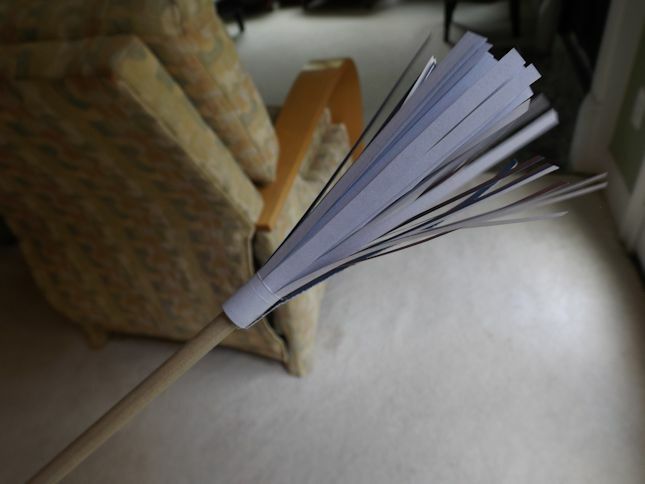 Next, take a skewer or dowel rod and position the paper at the end. 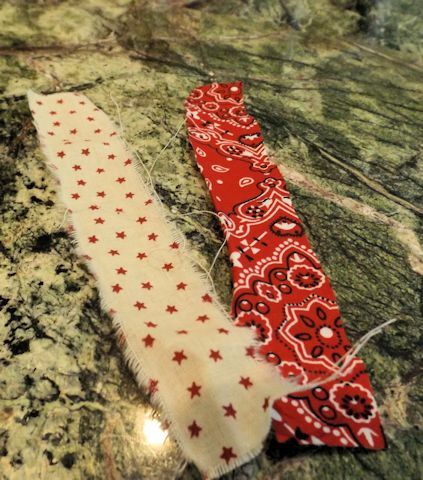 Dab with hot glue and start rolling with the decorated side in. Glue again at the midpoint of the roll and then again when it is all rolled up. 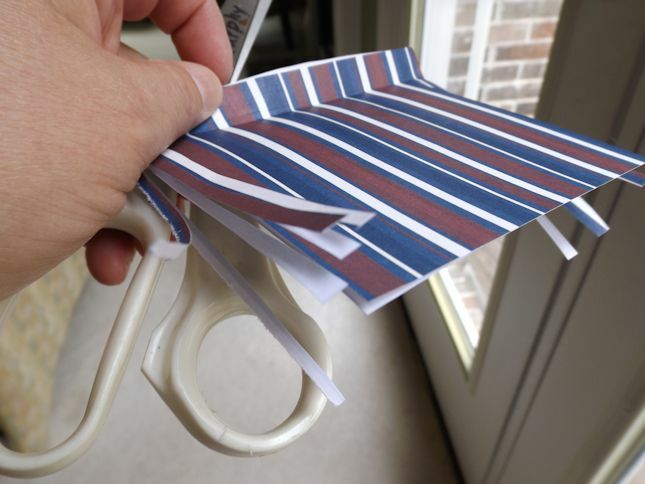 Use your giant man-hands (oh wait, those are mine) and curl the paper using scissors and your thumb like you would curl ribbon. Easy and so cute. 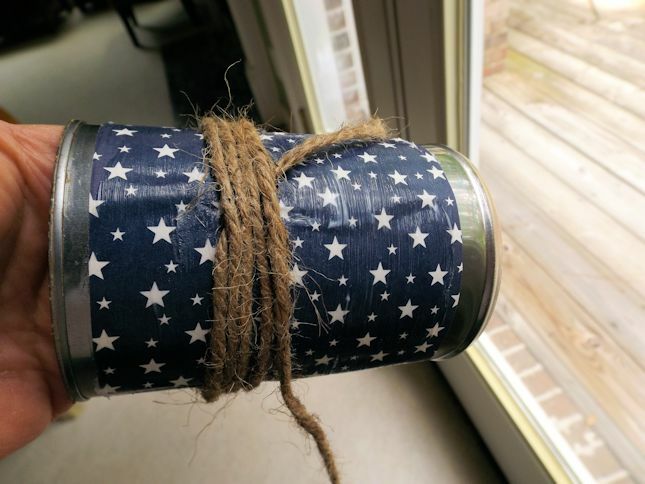 I made an extra can and put lentils in it to hold my fireworks. 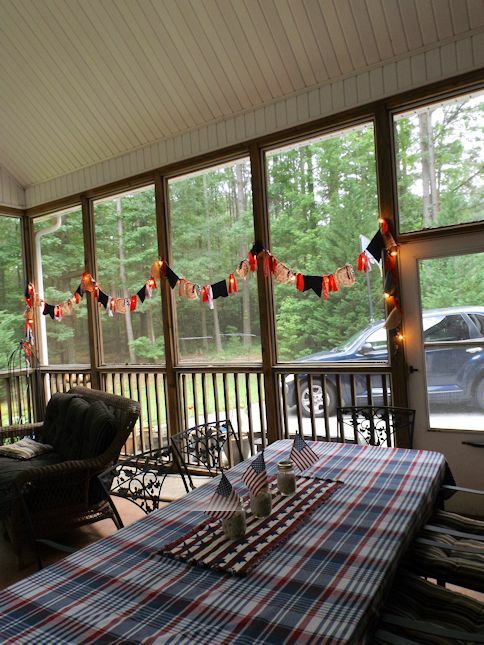 I used my jars of sand out on the screened porch on my table. You can also see the next craft hanging out there. I led the group in making a lighted garland. I purchased 24-foot light strands from The Home Depot last year after Christmas. 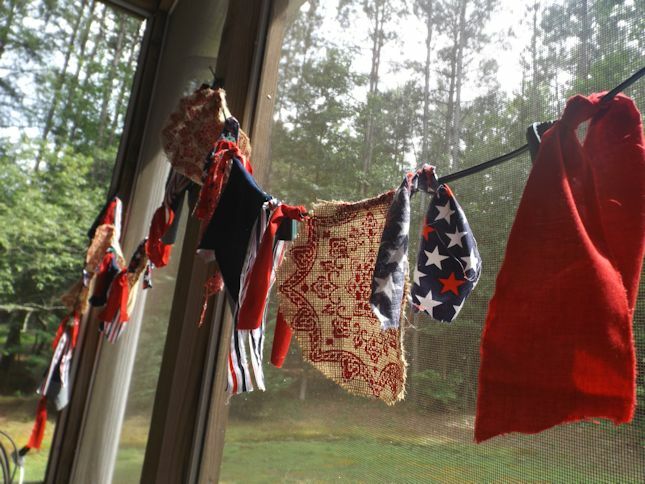 I went to Joanne’s and purchased a variety of patriotic fabrics and tore them into strips. 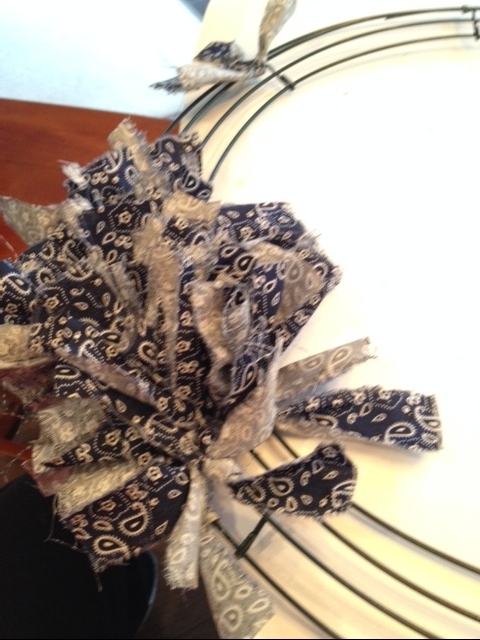 I cut circles from the decorated burlap fabric. 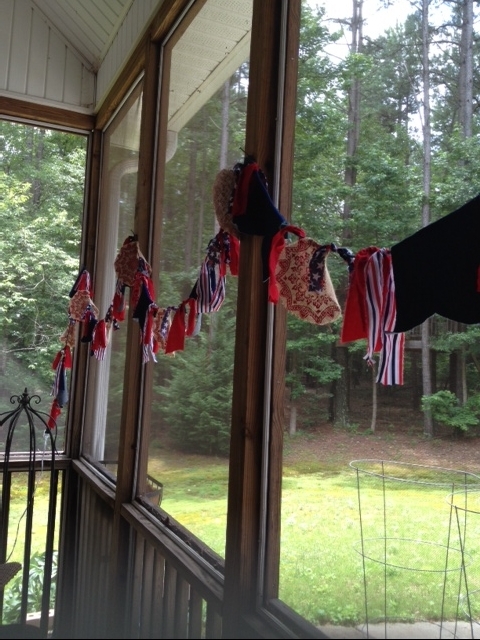 Using a hot glue gun or hand tying, we decorated as desired. The next craft also used torn fabric so they went together really well. Gina brought wreaths for us to make. I don’t see how she had the hand power to tear all that fabric for us ahead of time, but we really did appreciate it. I actually have it hanging in front of the window by the table but it is too back-lit to see it very well in photos so I moved it to the door to see it better in the picture. Gina tore strips into 1-inch by 6-inch pieces. 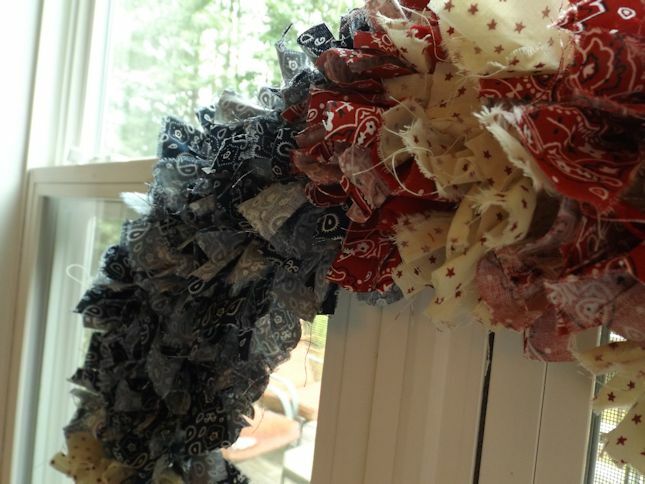 It takes about 1/2 yard of fabric for each of the 8 sections of the wreath. Two are blue and the rest alternate red and white. 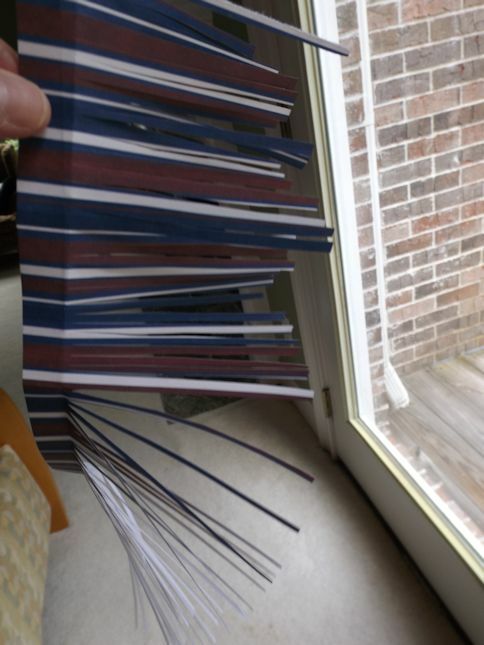 I ended up cutting some of my strips for extras and the look wasn’t drastically different in case your hands won’t hold up with all the ripping. 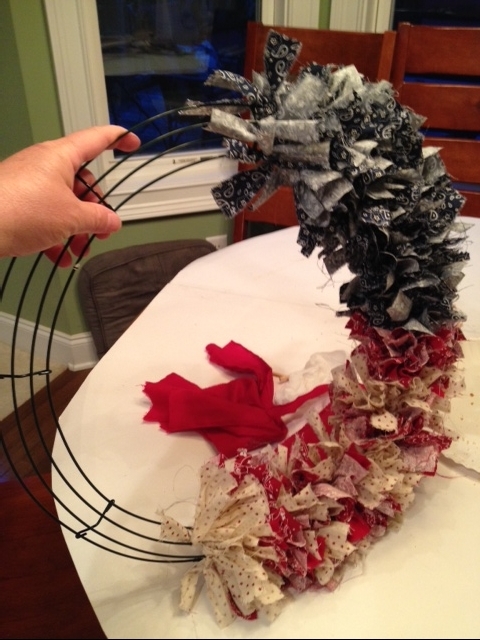 And then after two sections of the wire wreath switched to reds and whites. When you get to the reds and whites, tie 4 or 5 strands on each wire in each color before alternating to the other color. 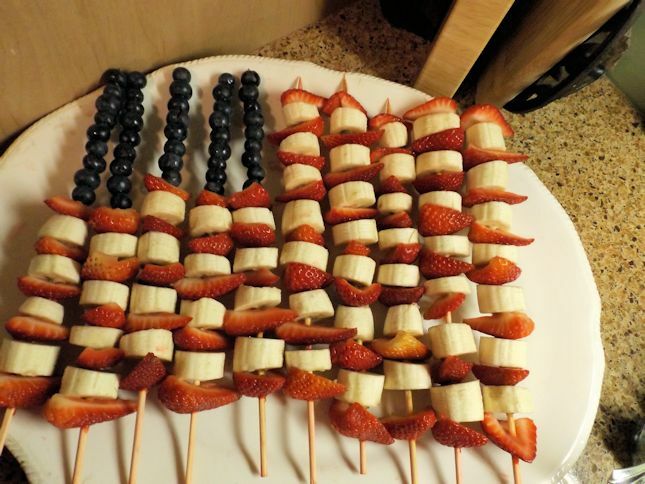 It gives it the striped flag look. 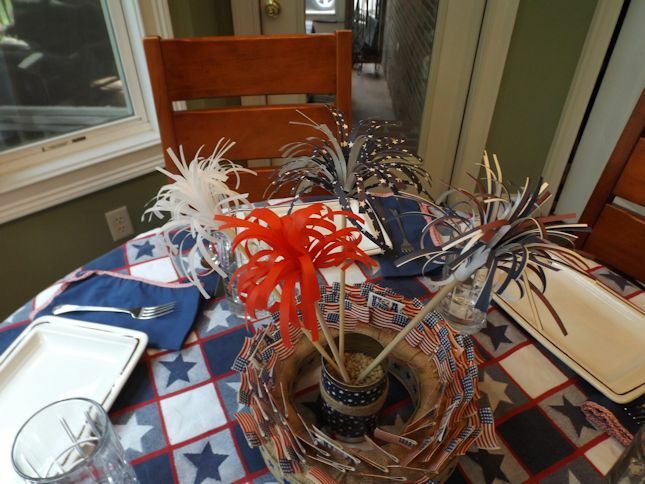 We didn’t finish that craft that evening but we did get a good start on it before moving to the another craft which was this beautiful centerpiece for the table. Amazingly, we didn’t coordinate crafts but everyone had a unique idea and they all went together beautifully. 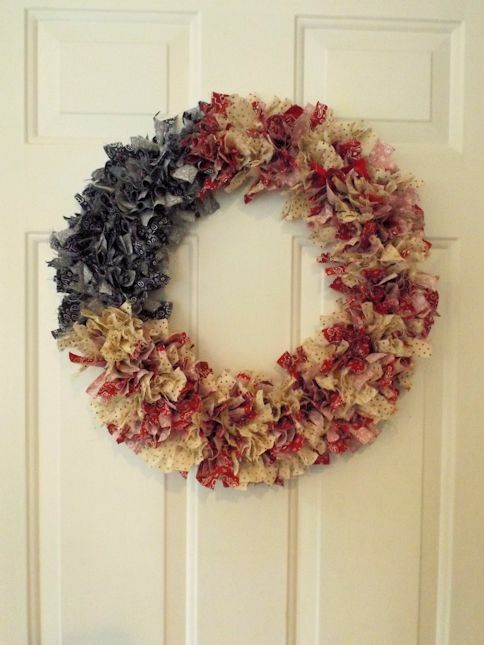 Wrap the wreath with the plain burlap ribbon and secure with glue. Place decorated ribbon in the inside and outside ring of the wreath. 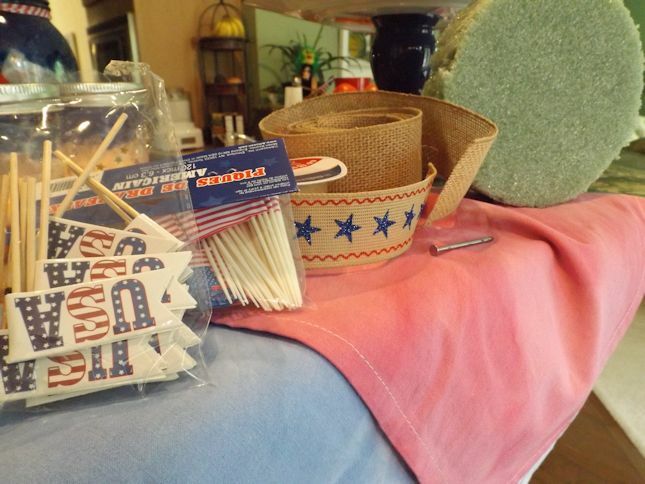 Then, use a nail to poke holes in the foam and place the cupcake flag picks all around the top as seen in the picture. It is now magically daytime in the picture below because I took it the next day but at this point in the evening, it was well past dusk. Another quick craft of mine was making Mason jar votives. 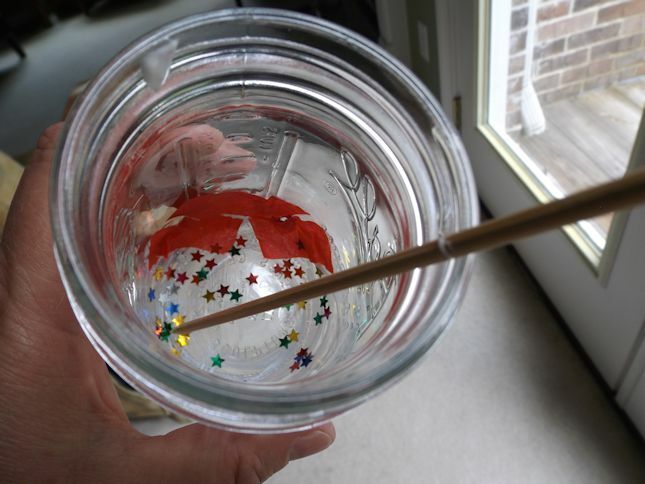 Take Mod Podge and use a paint brush to coat the inside of a jar. Start at the bottom and do one color at time. Use a skewer to add pieces of tissue paper. You can sprinkle in some glitter stars if desired. Then, paint over the paper with Mod Podge again. Be sure not to keep going over the paper or your glass will turn pink or baby blue with the paper. It runs easily. I used various sizes of jars and finished off with battery operated votive candles. 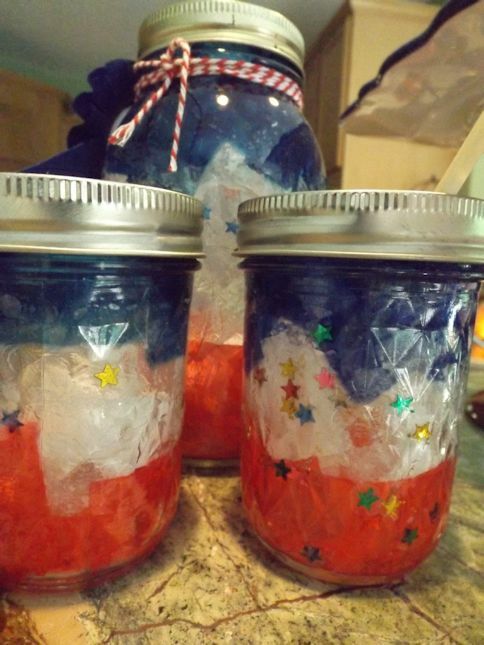 I put some party favor blue ribbons on the larger jars for a country fair look. 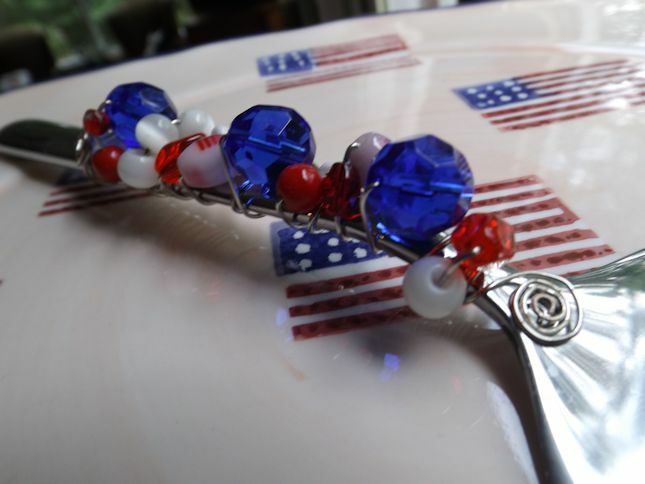 Two other crafts that you see in the photos that I made in previous years are these clothespin Uncle Sams and the beaded dessert server. 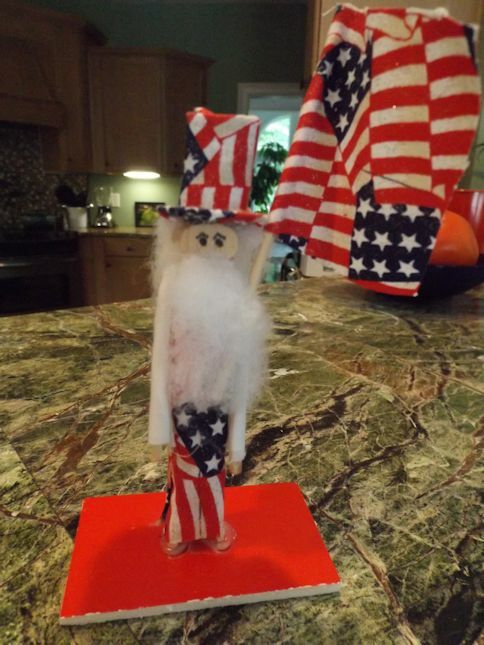 The Uncle Sams have been in my Fourth of July box for about 15 years. 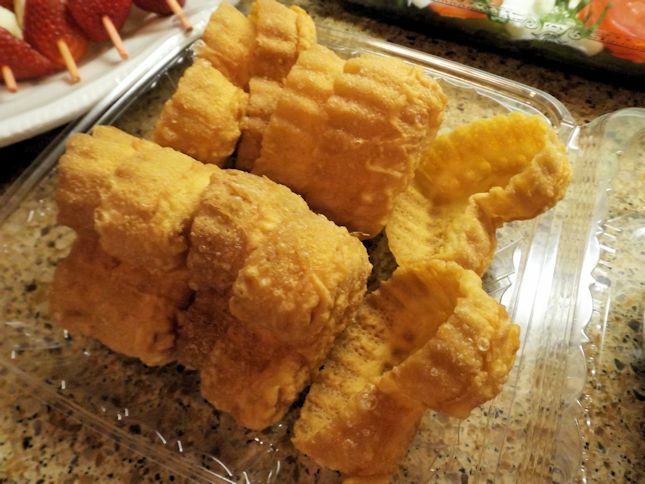 I made a bunch of them years ago and tuck them around my tables or serving counter every year. 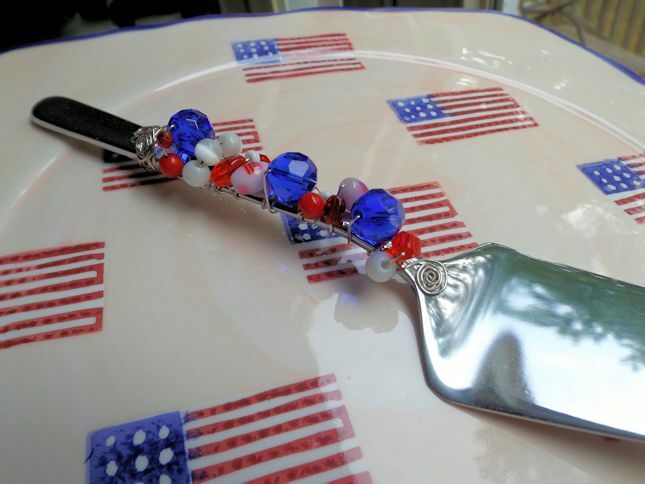 And the last craft of this very long post is my beaded serving utensils. They are easy to make with about 3 feet of 20-gauge wire and approximately 12 beads. Start by curling the ends of the wire and wrapping the base of the spoon or server. Add beads to the wire and keep wrapping as you go up the handle. Finish off with a tight wrap and tuck the end of the wire back through the wrapped handle or curl like you did at the base. This server is Oneida and comes from Wal-Mart. As I was walking around looking at the crafts, I kept thinking “Ahh, this garland is my favorite,” and then I would see the paper fireworks and think, “No, this is my favorite.” Then, my eyes would move to the wreath, and think, “Oooh, I really like this best, but then I love the centerpiece, too.” Needless to say, there is no way to rank these crafts so I quit trying. 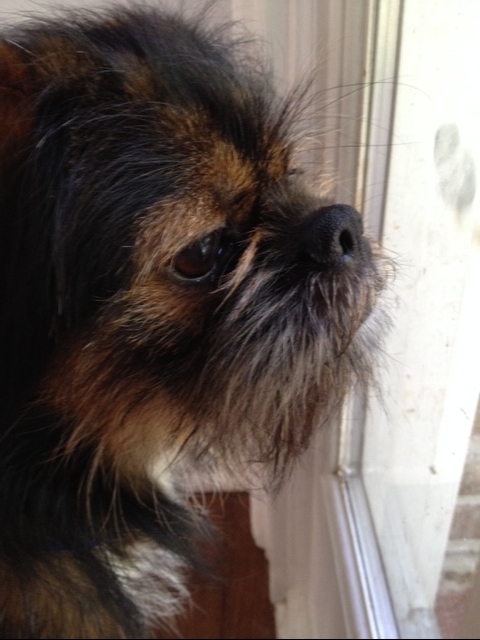 They are all lovely and only surpassed in beauty by the friends who gathered to make them. 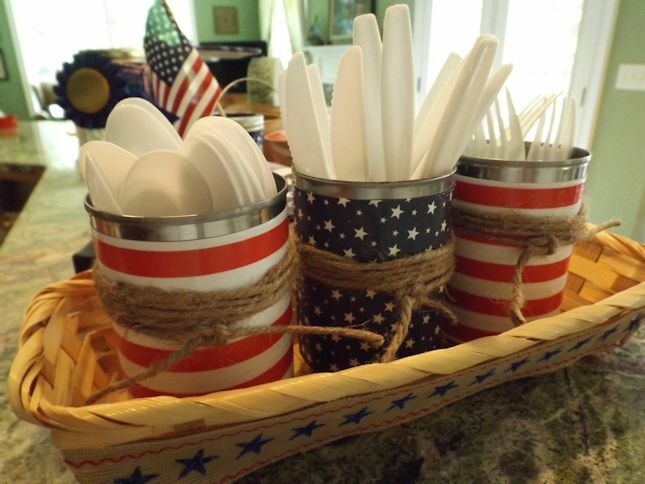 I’m really looking forward to the Fourth and using all these great ideas and beautiful decorations! Welcome back to Frankly Southern! So glad joined me today. I hope you will come again soon.